Just before Rylstone I was passed by a peloton from (I'm guessing) a local cycle club, who weren't sparing the horses. No kit, no extra weight, and the group strength to draft and motivate each other.. hugely above my average speed. I let them go. I'd been snacking all the way along so far, and was working through the second bottle of water, but I decided I didn't need the planned stop in Grassington – heavens above, it'd add three miles to my route – but when I got to Kilnsey I had to stop and have a closer look at the Crag. 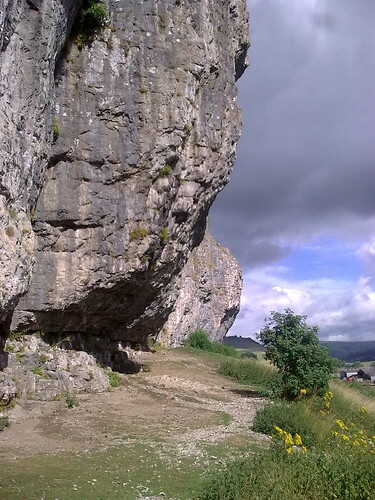 It's one of the biggest overhangs in Britain, reaching 170ft in height and with an overhang of 40ft. I'd been past many times, but always in a group – now was my chance to have a look for myself! I took an apple and my camera phone, captured a shot or two, and descended to find my bike had blown over. 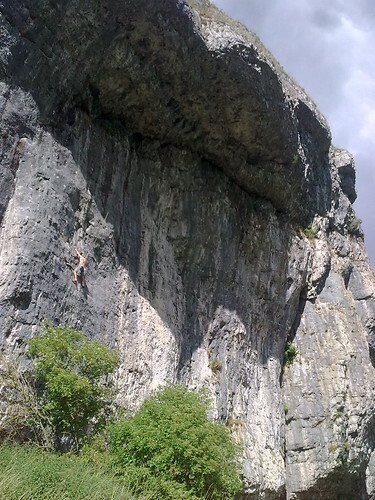 Good job it's not one of those fragile, lightweight things..
Kilnsey Crag. This is the stuff they build Yorkshire from. Half a mile later, I caught up with another group of cyclists at the junction with Littondale. Or rather, I passed them while they were regrouping, and they then caught ME. Three twentysomethings, uni friends, Adam, Tim and Kate, who were on quite basic road bikes (meaning lighter than mine), shop-bought water bottles in their cages, and just one of them had a bag on his back. Where were they headed? The same route.. they'd set off from Leeds at 8am, and though they'd cut a couple of corners off, the main reason they'd overhauled me was their impressive turn of speed, a consistent 15-18mph. They were very impressed with my setup, and the fact I'd got a map; I was just jealous of their fitness, their lack of weight, and their ability to go ahead and do something like this without backup, tools or preparation. I matched their speed for a while, but they were nowhere to be seen once I stopped at Starbotton to don waterproofs and then at Buckden to fill a bottle of my own. Waterfalls and sinkholes mean limestone. Well, if they'd left me behind on the flat, I wasn't going to catch them on the climb up to Kidstones Fell. The road reaches 424m, the highest elevation by 200m that I'd reached so far, as it passes between Cray Moss at 643m and the 702m Buckden Pike, linking Wharfedale with Bishopdale. I passed more classic limestone scenery on the way up, sinkholes and springs beside the road and near-hairpin bends before the plateau-like top.. well, if you ignored the fells flanking the wide saddle of the 'summit'. I passed, too, another group of cyclists who had stopped at the top – not Tim, Adam and Kate though; these folks were actually wearing cycle kit rather than shorts and t-shirts. Finally I was passed by three cars and two motorbikes before starting the descent – I was glad to let them go so I wouldn't be holding them up on the way down to Aysgarth. Did I, heck. I don't hang about on my way down hills, and though both windy and windy (pronounce it both ways) I hit 48mph on the descent, catching the slow-moving convoy stuck behind a cautious BMW. On the way, I locked the back wheel, on the brakes, on a greasy downhill Z-bend.. but nothing was coming up the hill so I did as the pros do and used both sides of the road. 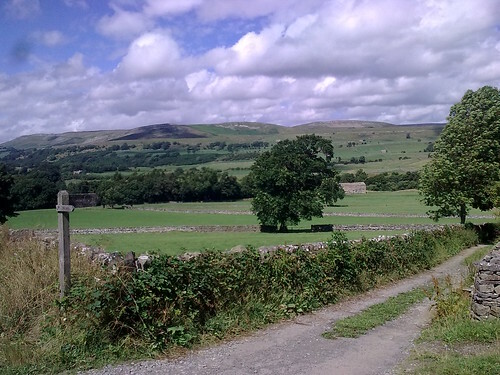 It will be here, if anywhere, that riders are caught out by the terrain – from here the road doesn't stop winding through trees until just before Aysgarth, and it's never wide. God forbid, but I'd expect to see any crashes here, certainly if the weather is inclement. As it was, after several miles pootling at 25mph, the BMW let us all past and I caught Tim, Kate and Adam a few miles shy of Aysgarth. Tim had local knowledge so we could chat about the route, but all were good company and seemed to enjoy mine too, though they wanted to continue on and conquer the Buttertubs pass before eating; I'd ridden over 60 miles before noon (a personal record by some way) and had not had anything substantial since my 9am scone, so I bid them my best, and stopped for a hot beef roll and a pint. Setting off again at 1.15, I'd had a good break and replenished some reserves, but found that I was now headed into the wind for the next ten miles until I reached Hawes. Beautiful scenery and sun-kissed colours were all very well, but forget hills – it's a headwind that saps your morale. Those ten smooth, rolling miles took me almost an hour – a shame, because with higher spirits and more time I'd have appreciated the shapes around me far more, maybe even visited Semer Water, the largest natural lake in Yorkshire. 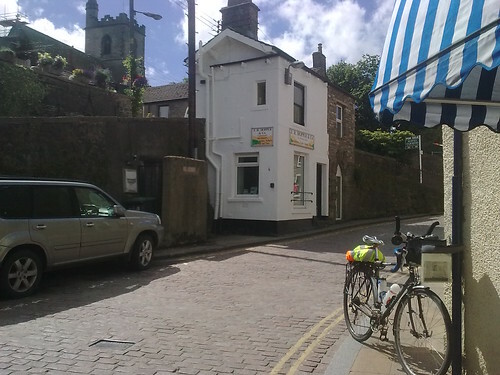 I was glad to get to Hawes though, and squirmed my way round its cobbled one-way-system centre before finding a bakers to top up my snack box. That'd keep me topped up until Reeth, I thought, but I needed water – I stopped at the White Hart where a sun-kissed, laughing young clientele were cheerily making the most of the weekend. I left my bike while I went in, despite their pretending they might not be trustworthy – well, I told them they'd not tried lifting it. Hawes makes few concessions to the 21st Century. Neither should it. I came out with water but a bitter taste in my mouth. I may not have bought anything, but I'd hope for at least politeness and common decency even if they'd refused me the water. Can you only expect civil, good-natured staff if you're spending money? Is begrudging, sniping service ever acceptable, even if you're wanting something for nothing? 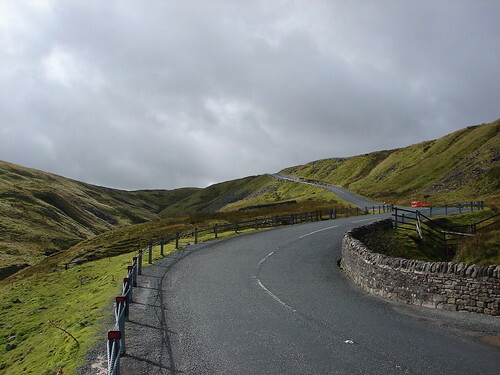 It took the Buttertubs pass to eventually make me forget my mood, not helped by missing the uphill turn and ending up at Hardraw by mistake – the only genuine 'wrong turn' I took all day. Buttertubs starts off as a lattice of small roads stepping slowly up from the Ure floodplain (now you know why they chose to call it 'Wensley-dale'), before ramping it up with a vengeance, gaining 100m in the first mile-and-a-half, then another 100 in the next kilometre. It then calms down a bit, though you've still got another mile-and-a-half of steady gradient 'til the last hundred metres has been conquered. The good news is that you'll be left stunned by the view – mountains all around (well, 600m-plus peaks on six sides) and a long valley (Fossdale Gill) down to your left. At touring pace this is a challenge – after 70 miles and at race pace, this will tax the front-runners, certainly if it's hot.. Eventually the climb reaches the cattlegrid and a vista opens in front of our emotionless, animalistic elite riders. 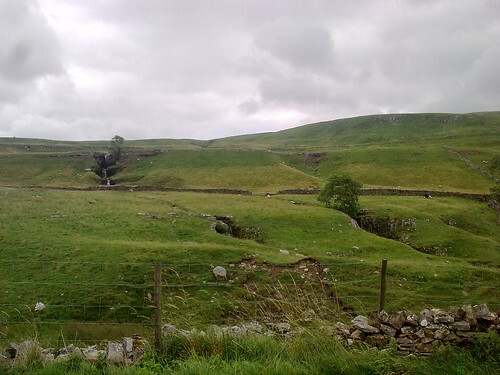 The Buttertubs pass now reveals its name – a dry valley with yawning, 20-metre-deep sinkholes where the rain found the limestone a more direct route than the riverbed on its way down to the Swale. 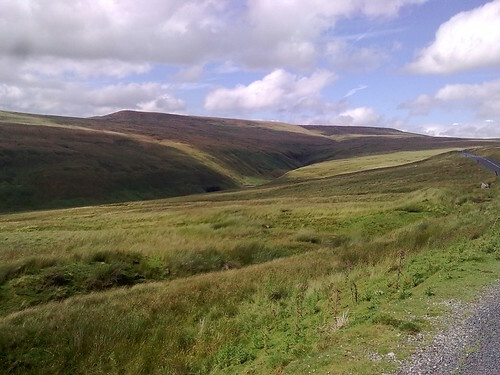 This was the main route between Swaledale and Hawes – it still is – but you don't climb to 526m unless you have to. In the heat of summer, farmers bringing their dairy produce to market would rest beside the cavernous openings and lower their churns down into the water below to cool it down. 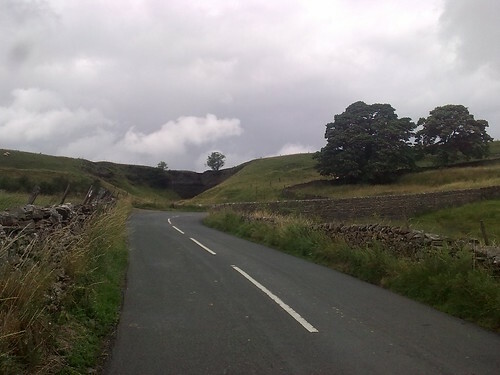 Here is another point where the unwary rider could find himself caught out by the swing of the road – Goodness knows, the views are distraction enough. I wish all riders well, but whether all make it safely down or not, this would make probably the most compelling viewpoint of the stage. However, with two million spectators lining the route the last time it came to Britain (Kent, in 2007) – admittedly rather closer to the population of London – I wonder where a spare inch could be found to fit another viewer in. This will surely be the prime spot for the crowds. Posted by Dan on August 10th, 2013. Well done Dan, an excellent write up of a cracking ride. You may not have been quite as swift as the 3 students but 13 mph average over such terrain is pretty impressive. As you say the Tour will be a fantastic show case for northern England, I've already reserved my accommodation with my friend in York! Good ride, good writeup, and goodness gracious, a small bit of jealousy over here. That looks like a great route. 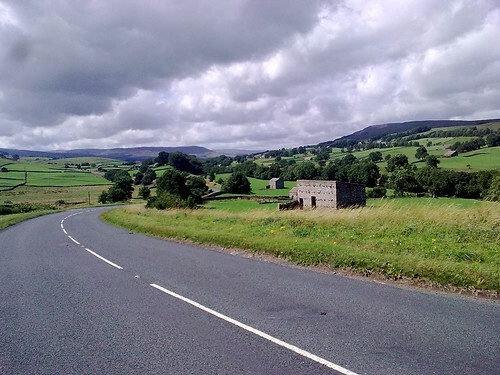 Dan wrote: I'd avoid the smoothest major routes and take a few detours on other roads I've found more interesting – the other side of the Wharfe, and the Fleet Moss climb to Hawes, for example. Well done Dan. Grand photos. Buttertubs looks lovely. I intend to be there, just not sure where exactly. I took that to mean that Dan had settled your tab, Patrick. I would imagine B&Bs are now being booked up quickly. Campervan hire? Parked up Buttertubs a few days in advance could be the dream family holiday. 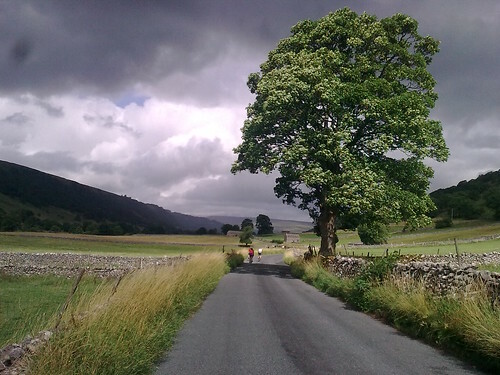 Road closures and other info on Yorkshire Dales National Park website (PDF). Cheers everyone! Yes, it was a fun route to do, and good fun (if hard work) to write up – I managed it just before setting off from a choral singing course in Surrey which took up the whole of last week! (And yes, I took my bike – they have some cracking little roads down there!) I hope enough people google 'Tour De France 2014 preview' to find this report and be inspired.. looking at Patrick's link to the FAQ at the Yorkshire Dales National Park page also looks useful and should be updated closer to the time. It also gives a link to another site, http://www.cyclethedales.org.uk, a general Yorkshire cycling site with more details on Le Tour, and with a 'spirit of Le Tour' ride of 75 miles covering the 'best bits' of the ride, and accompanying blog, that may appeal to those who like the idea of the ride but don't fancy the main road/distance involved. It looks like a great little (!) route and I'd recommend it to anyone who fancies a more manageable challenge. Patrick – whoops, I paid for your tea but forgot your toastie 😳 guess that means I've gotta go back! Cheers for your flickr help! Brilliant write up Dan. Loved reading this. We only just missed one another! 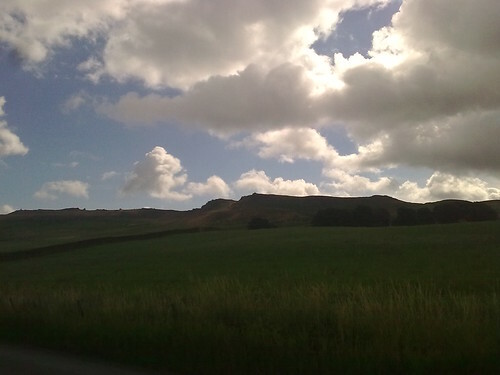 I was staying at Hawes with Beth on the 1st August on our way home from Thirsk. At the dairy at Hawes (Wallace and Gromit) you can buy special commemorative soaps and other souvies with the Tour of Yorkshire on them.